Imagine hearing thunder, and the chilling fear that follows, knowing that a tornado may be swirling off in the distance. The people of Joplin, Mo., have coped with this unsettling feeling every day since May 22, 2011, when an F5 tornado ripped through their city. The natural disaster that impacted Joplin was part of a larger band of storms that reached a maximum width of more than one mile wide as it tore a path through the southern part of the city. The tornado rapidly intensified and tracked eastward across the state. This was the third tornado to strike Joplin since May 1971. 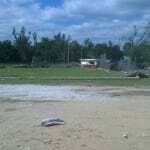 Amidst the ruins were the remains of Sunny Jim Park and Stan Huff Park, home of Joplin South Little League (JSLL). 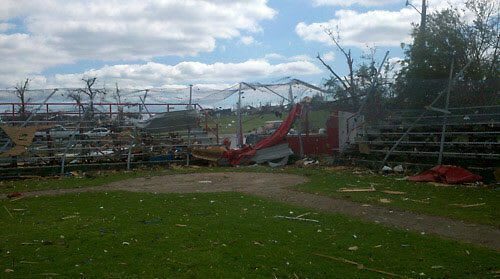 The 300 players in Joplin South Little League had no place to play, and the league’s parents and volunteers had little sense of where to begin as life in Joplin, had literally been thrown to the wind. For Tom and the rest of Joplin South, that sentiment was easier said than done. 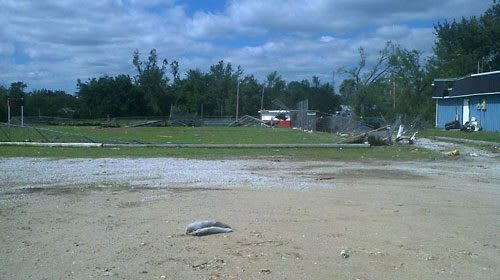 In the days to follow, Joplin South and Mike Greninger, Missouri District 2 Administrator, each were contacted by several agencies and individuals offering a variety of assistance. Mike received one call in particular that proved to be uniquely uplifting. “Tom Brasuell with Major League Baseball called me,” Mike said. “He was checking in to see if everyone was OK. It was weird because people on the outside knew more than we did. 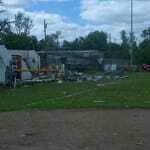 Mr. Brasuell, Vice President of Community Affairs for Major League Baseball, reached out to Mike almost immediately after he became aware of the tornado. Mike knew Mr. Brasuell through their connection to USA Baseball, the governing body of amateur baseball in the United States. In his travels, Mr. Brasuell had visited Sunny Jim and Stan Huff Parks, and he made it clear during their phone conversation that Major League Baseball was willing to provide assistance. The assistance that Mr. Brausell described would come in the form of experiences that could not erase the memories and visions of the destruction, but, for a while, provided a distraction and welcome enthusiasm. Working through David James, Director of Major League Baseball’s Reviving Baseball in Inner Cities (RBI) program, Mr. Brasuell extended an invitation to Joplin South Little League to participate in several activities connected to the annual Major League Baseball All-Star Game. The 2011 edition of the Mid-Summer Classic was played in Arizona, and Joplin South Little League assembled a team of 12 players to make the trip to Phoenix. Tom was selected by the league to chaperone the group, which played in the RBI tournament, took part in the Field of Dreams clinic with Diamondbacks’ outfielder Justin Upton, attended MLB’s FanFest, celebrity softball game, Legend’s Game and Home Run Derby. The days in Arizona served as a wonderful diversion, but once back in Joplin, Tom and the rest of the JSLL board still had hard choices to make. 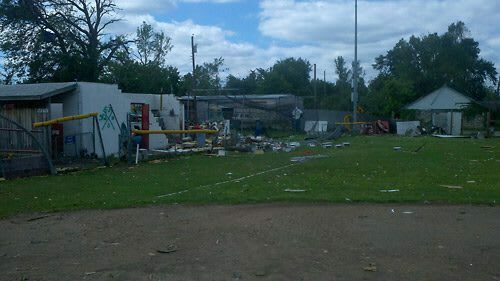 With its facilities flattened, Joplin South Little League was not able to host the 2011 District 9 and Missouri State Major Division Baseball Tournaments. 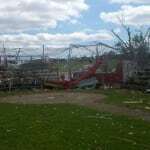 Those games eventually were moved to Joplin North Little League, which was not impacted by the tornado. Sunny Jim Park had been a community fixture since 1950, with generations of Little Leaguers growing up on those ball fields. The destruction was emotional and overwhelming, yet the league’s perseverance has prevailed. Since the summer, the outpouring of support has continued. The Kansas City Royals and St. Louis Cardinals have each reached out, as has the University of Missouri. Joplin is full of baseball fans proud to wear their “Cardinal Red” and the “Joplin Cardinals” were not quickly forgotten by Major League Baseball. In fact, the miracle run made by St. Louis, that earned a postseason berth on the final weekend of the regular season, afforded the players from Joplin South Little League with one more amazing experience. “On Thursday afternoon, David James called to invite the ‘Joplin Cardinals’ to Game 7 of the World Series,” Mike said. “The plan was to go, but when I got the message about 9 p.m., the score in Game 6 was 7-4 for the Texas Rangers. I didn’t look like there would be a Game 7. Tom called the players’ families before 7 a.m. the following morning and the group was on the road by noon. The four-hour drive to St. Louis was surreal. 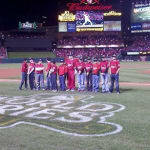 Game 7 of the 2011 MLB World Series was dedicated to the relief efforts in Joplin. 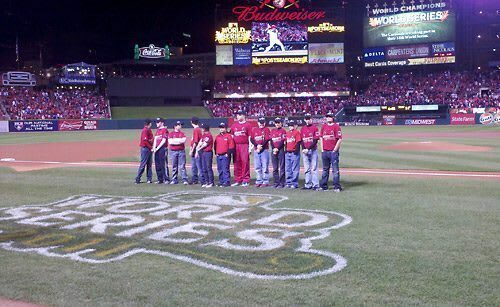 On the field at Busch Stadium, the players enjoyed several pre-game activities including watching batting practice, standing behind Chris Daughtry as he sang the National Anthem, and recognition by the public address announcer as a video played highlighting the ongoing recovery projects. The team stayed until the final out was made, enjoyed the celebration after the Cardinals improbable World Series victory, and got back to Joplin around 4 a.m.
“Everything we did was well worth it, but it is still hard to comprehend,” Tom said. “I wish all the kids in our league could have experienced what these kids have done.